With her rock and soul fusion of music genres, Alice Springs own Catherine Satour shares experiences through song that tell of life, love and place, to give understanding of her place in the world. Catherine Satour is the daughter of Bunna Lawrie, founder and front man of prolific Australian Indigenous band, Coloured Stone. Satour already has a music career spanning 16 years as a solo artist. With many a gig under her belt, Catherine Satour is a dynamic front woman in her own right and is set to take you on a musical journey with a stellar performance on stage with her seven piece band and special guest performers. In 2011 Satour had her original music orchestrated with the Darwin Symphony Orchestra in Songs From Big Sky Country. This production was a special feature event for the Alice Desert Festival and was broadcast on Catherine Satour and Band NITV. 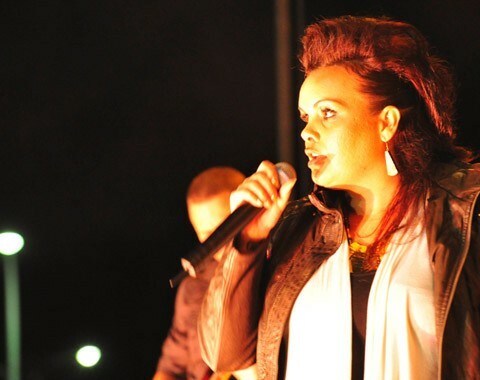 In 2012, Catherine Satour played Wide Open Space Festival, Darwin Festival, Alice Desert Festival and was nominated for a National Indigenous Music Award; the G.R. Burarrawanga Memorial Award; for significant achievement in the NT music industry. As well as her career as a solo artist, Catherine Satour also facilitates singing, performing, song writing and music workshops within Central Australian schools, youth and arts organisations and remote communities, to encourage, support, and develop other artists. With her debut solo album set for launch, Catherine Satour is certain to deliver an extraordinary performance.